We’d planned on paying a visit to the stadium the previous day, and decided that it might be apt to hook up with facts concerning the stadium. Galle paid host to witnessing spin greats Shane Warne and Muttiah Muralidharan grab their 500th and 800th wicket respectively, with the latter signing off his legendary Test Career at Galle. The darker side of Galle has other stories to reveal – the devastating effects of the 2004 Tsunami bearing source to tales that we’d never have entertained even in the wildest of nightmares. We realized that it might be essential to brush on a few facts that we thought we might be oblivious to – the effort behind getting the stadium back and running by 2008. But soon, we learnt that what we’d gathered wasn’t nearly enough: if you want to know about the stadium, it only makes sense to get there and absorb its uniqueness – ranging from the Galle Fort, a UNESCO World Heritage site which overlooks it from the background and its geographic distinctiveness of being tasseled on two sides by the Indian Ocean. Galle received sufficient press coverage to win the sentiments of people from around the world, following the tsunami tragedy of 2004. A volatile cocktail of facts would spell out the laudable efforts that were put in to get the stadium reconstructed (a project that cost in excess of 500 million LKR), and the battles that had to be contested against the Archaeological Department that raised its voice to object construction of buildings that would obstruct the view of the Fort. As outsiders, we could do little but sympathize and contemplate on how quickly things can change in life. Natural disasters are ghastly under the best of circumstances. On this note, we arrived as innocent visitors hoping to catch a glimpse of the ground which Brian Lara, among many other cricketers, had picked as among his most picturesque venues he has played in. Galle is getting ready to host the T20 Women’s World T20 starting September 26 – in fact, all the league games as part of the Women’s World T20 are being held here. We walked in to one of the administration offices to check if we could speak to some one on recording a documentary focusing on the preparations being made for hosting the Women’s World Cup. We were directed to the main building in search of a certain Mr. Warnaweera. We met a colleague of his in the office, who informed us that Mr. Warnaweera wouldn’t be here for until another hour. We explained our objectives and soon, we were given a go-ahead to walk around the stadium – but we were told to avoid getting close to the wickets. An hour had passed by the time we finished interacting with staff working across different departments from within. We thought it’d be a good idea to head back to the main building and connect with Mr. Warnaweera. We met him as he was heading to his office and introduced ourselves. He introduced himself as the Secretary of the Southern Province Cricket Association (among other titles and responsibilities he holds) and was, by his colleagues’ words, described as the sole proprietor of the Galle Cricket Stadium. He knew about the venue more than anyone else around – he undertook the responsibilities of being the curator himself. He was very warm in welcoming us and inviting us over to his office for a discussion. The conversation that followed set the tone for a prolonged discussion on assorted topics (cricket aside – politics, culture and philosophy) in circumstances that we’d least anticipated. As a former off-spinner for Sri Lanka (1986-94), he explained the challenges of growing up during the era of insurgency that saw very little of Sri Lanka in the international stage. This theme kept coming up in our discussions, though less vividly at later stages of our conversation. In a free wheeling chat, he discussed a wide ranging topics from administration issues, new talent emergence, best batsmen he has seen to the best ones he had bowled to. Responses include his disappointment in the roads that T20 has paved for the younger generation of cricketers (who “cannot play Tests”) and his assessment on the match-fitness levels of players, who, he otherwise feels, are spending more time focusing on being gym-fit. His straight-forwardness, dedication towards the sport, and his love for Galle (the stadium in particular), stand out on numerous occasions – most notably observed when his colleagues endorse the days and nights he’d put in consecutively to ensure that the reconstruction of the stadium proceeded as hassle-free as possible. His hospitality was beyond description – incidentally, an Irish contingent had arrived at the stadium (including former Captain Peter Gillespie and former Coach, whose name I fail to recollect ) in seek of permission to have a look at their wicket (Sri Lanka has lost only 4 of the 20 Tests played at Galle) and find out the composition of the soil. He excused himself for a few minutes, and was back to continue the chat (we gather that the Irish party’s requests were not entertained). He explained that the World Cup victory in 1996 had shaken things (for the good) considerably in Sri Lanka. There was a push from the ICC to elevate Galle to an international venue, a target that was achieved in 1998 when New Zealand toured Sri Lanka in June to play a Test at Galle. An ODI, against India, was hosted a few weeks later. He was very open and generous with his time – we’ll never forget the long afternoon that we’d spent with him, fielding fundamental questions on the state of affairs in SLC, T20 cricket, the lack of involvement of the retired greats with the current setup, among others. We were served a sumptuous meal following which we resumed our conversation. 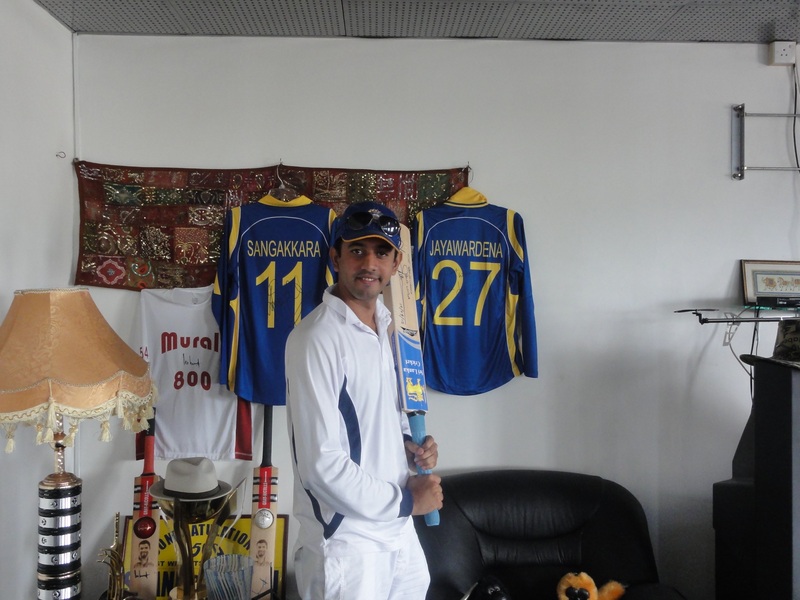 Goutham Chakravarthi poses with the bat donated by Brian Lara, a few days ago, on account of his first visit to Galle post 2004. One look at the venue through the French Windows of his office is sufficient to comprehend how Mr. Warnaweera reacts to the lavish praise people shower on him with regard to his brainchild (a term used by a lot of his colleagues). The credit always belongs to the man who is day-in and day-out at the arena – the man who sweated blood during the darkest days of this venue’s history. The triumph of his phenomenal achievement has been the ability to let people watch a game of cricket at this breath-taking venue. That his colleagues rate his work-ethic, dedication, and passion so highly is evident when one strolls around the Galle Cricket Stadium. That force is Jayananda Warnaweera’s greatest achievement, and the heart of his significant service to the people of Galle and cricket lovers from around the world. PS: A video pod on the day’s events and various interviews with administrators, structural engineers, fans and Jayananda Warnaweera form the theme of our second video podcast that will be updated shortly.